Antioxidants are substances that neutralize these free radicals and the potential ill effects. 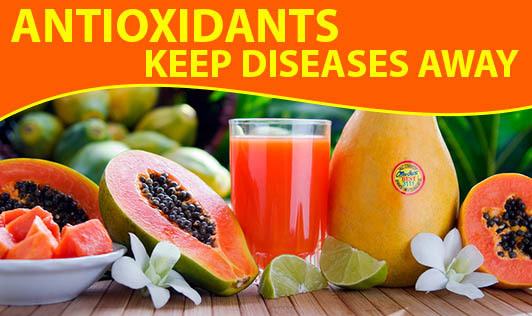 There can be enzymatic (catalase, superoxide dismutase etc produced in the body) or non-en-zymatic ( vitamin C, vitamin E, beta carotene etc) antioxidants, plant chemicals like flavonoids, zeaxanthins, Indoles, isothiocyanates and others also contain good antioxidants properties. It is estimated that there are more than a thousand compounds in foods that act as antioxidants. Orange, yellow fruits and vegetables and green leafy vegetables contain vitamin C, carotenoids such as beta carotene, lutein, and zeaxanthin. Citrus fruits conatin flavonoids, di-limonene and flavonoids. Cruciferous vegetables contain indoles isothiocyanates, and beta carotene. Garfic and onion family contain allylic sulfides and quercetin. Legumes contain isoflavonoids, phytic acid and phytosterols. Spices like turmeric and mustard seeds contain curcumin and isothiocyantes. Red grapes contain quercetin, resveratrol, and anthocyanidin. Tomatoes contain lycopene. • Reduces risk of heart disease, hypertension and stroke. Some of the foods that have a high oxygen-radical absorbance capacity (ORAC) are avocado, citrus fruits, berries (strawberries, cranberries, blueberries, raspberries), grapes, broccoli, onions, cabbage, spinach, carrots, and tomatoes. This does not mean that other. Foods with their antioxidants are ineffective. All antioxidant foods, along with varying degrees of antioxidant properties also contain other nutrients. Therefore, it is important to balance our food intake right through our lives. Studies have shown that the vegetable and fruit intake of people here is lower than required. If we could only increase these intakes, we would get a lot more natural antioxidants through the daily diet. A word about antioxidant supplements. Taking supplements does not guarantee protection against disease. Sometimes, large doses of supplements may be harmful. Most of the time, a healthy person who eats well balanced meals and is physical active does not require any antioxidant supplements.